It’s been a while since we’ve had such a strong hurricane pass so close to us here in Central Florida. Matthew was a category 4 storm last Wednesday as it approached our east coast and had just roared through Haiti with devastating effects. Luckily, it veered a little further away and winds were lower than forecast when it hit here. We had strong rain and winds, power flickers, trees down, and some damage in our area on the North East side of Orlando. But we were spared most of the dire effects that we worried about. Friends from New Smyrna Beach stayed with us and they too reported very few problems from the storm, although they lost power for a day. Anyway, I wasn’t able or even motivated to do any photography last week. So instead I’ll show you an image that has nothing to do with storms, from our recent trip Shenandoah. Bear Fence Mountain Panorama – This is part of the vista from the top of Bearfence Mountain in Shenandoah National Park. It’s one of the few places there where you get a true 360 degree view. This image is a mutli-frame panorama stitched together in Lightroom. Scrambling up this rock pile on the top of the mountain, I had to acknowledge that my 64-year-old knees aren’t as good as I thought. But I did make to the top and the view was awesome. I hope all of you also came through hurricane Matthew ok. If not, our thoughts and prayers are with you. And thank you for stopping by and reading my blog. If possible – go make some photos! I hope you don’t mind a few more photos from Virginia. The wildflowers and butterflies were beautiful, and the birds varied from what we normally see in Central Florida. Chicory bud wildflower. Thanks Charlotte Norton for identifying this for me! There were butterflies everywhere, probably because wildflowers were everywhere. We had a marvelous little meadow under the balcony behind our room. It was fun and relaxing to sit there and watch all the activity. Bees and birds were busy too. We stood in line for the dining room at the lodge one night and the woman in front of us was carrying a large DSLR camera and lens. She lived close by and had come up to photograph butterflies in Big Meadows. I said we were enjoying them too, and then we started talking about birds. I was all excited about the Indigo Buntings and American Goldfinches we’d sighted, since we don’t often see them in Florida. She didn’t seem to care about such common birds – and was much more interested in getting to Florida to see some Spoonbills. To each their own! Eastern Towhee (life bird!) – Thanks Kevin McKinney for the bird ID help! And one more image to wrap up. I made all the photos in this post with a micro four-thirds camera and 100 – 400 mm lens (200 – 800 mm equivalent). I found it very useful for close up photography and even though I had a macro lens with me, I never used it. On July 4th, 1936, in the Virginia Blue Ridge mountains along Skyline Drive at Big Meadows, President Roosevelt dedicated Shenandoah National Park. Since that time, people have greatly enjoyed wonderful vistas, beautiful waterfalls, quiet wooded hollows, hiking, wildlife and the night sky. I’ve been to Shenandoah many times. It’s the first national park I ever visited – too long ago to admit. I hiked there with our Boy Scout troop from Bowie, Maryland when I was a very young man . Hiking’s a major activity at the park – the Appalachian Trail runs along and crosses Skyline Drive in many places. Lynn and I also took Mike and Mary there when they were younger and we have fond (and scary!) memories of hikes with those two scrambling over rocks and along ridges to be first to see a view. On one of our visits, we also picnicked with our good friends the Sullivans, and hiked with the kids down to Dark Hollow Falls. 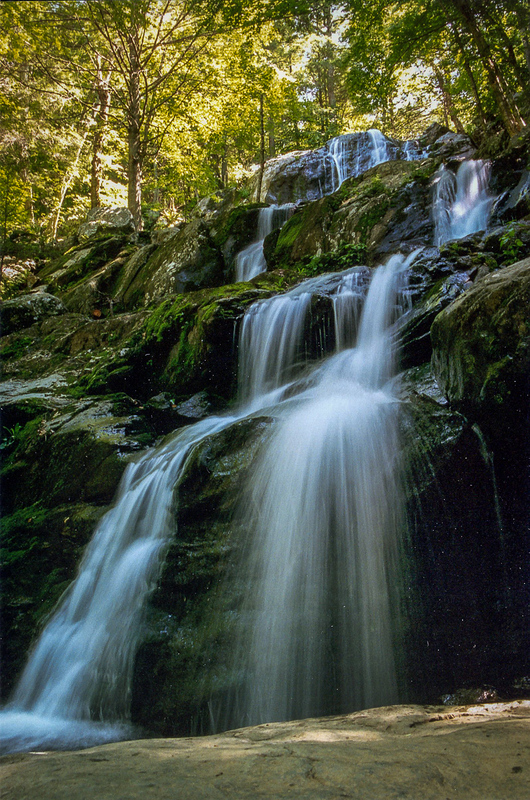 Dark Hollow Falls – A gorgeous waterfall, although crowded at times since it’s one of the closest ones to Skyline Drive. (Photo from 1996). Dead eastern hemlock trees – Hemlock Springs, Shenandoah National Park. We really enjoyed hiking through large stands of hemlock trees the last time we were there, 20+ years ago. Now, 95% of the Hemlock trees in Shenandoah have been killed by the hemlock woolly adeligid, an invasive species introduced by humans. Weather can vary in the park. All of our visit was beautiful, but we spent one day completely socked in with heavy rain and visibility of 50 to 100 feet. I had fun walking around in the fog looking for photos, while Lynn wove a White Oak basket from scratch. We saw lots of wildlife while we were there. The deer are all over and not very skittish, since animals are protected in the park. We also saw 2 black bears – exciting! I didn’t look too hard for birds, but managed to spot at least one life bird (Dark-eyed Junco). If you search the web you’ll see things to do in the surrounding area too. We’ve been to Luray Caverns in the past, although we didn’t have time to explore outside the park this time. In summary, Shenandoah National Park deserves to be on your bucket list. If you haven’t been there yet, just go. If you have been there, you know what I mean. You can see larger versions of the photos above by clicking on them and some other photos from our trip in this album on Flickr.